"Think of him still as the same, I say he is not dead - he just went away"
Three years. of Army apprenticeship training in Group 43A produced a B3 Bricklayer and very much more. Wally or "Tubby" Linham was one of the "special breed," who benefited totally, from this particular style of group training. This group training, which in his early life, developed the strong characteristics that stayed with him throughout his career and into civilian life. On leaving Chepstow and embarking into adult service, he followed the set pattern of basic Sapper training, in 163 party at Malvern. Afterwards, it was down to Chatham to complete a BII Bricklayer course. By January 1947, Wally, with many of Group 43A, had volunteered for Airborne Forces and the Parachute Training Course. Having passed selection, he joined 6th Airborne Division in Palestine. 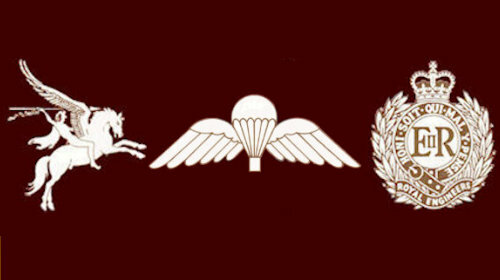 After the breakdown, he joined 9 Independent Airborne Squadron RE, within 16 Parachute Brigade, serving in Hameln, Aldershot, Cyprus, Egypt and back to Aldershot. By this time, "Tubby" had established himself in the rank of Sergeant. November 1954 saw "Tubby" move on, but within the Airborne Forces structure, to the Army Air Transport Training & Development Centre at RAF Old Sarum, Salisbury. His next tour of duty, took him to Hong Kong and Singapore. He returned to the UK in 1959, where he spent three years at the Training Regiment at Cove. He returned "home" in 1962, when he became a Permanent Staff Instructor with 131 Airborne Regiment RE (V), looking after the Edinburgh Squadron. Finally he returned to 9 Squadron in the post of SSM at Aldershot and completed a successful tour of Aden. In 1967 he was commissioned and posted to 36 Engineer Regiment RE at Maidstone. 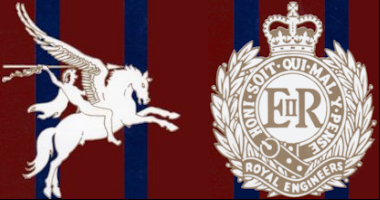 His second officer tour was as Adjutant of the Royal Monmouth, Royal Engineer Regiment (V) RE. After a twelve-month break, as the RE resource's officer for the Army Aldershot Show, he returned to Monmouth as the Regimental Training Major. To be asked to return to such a prestigious post, for a second tour, was a measure of the high esteem he had earned in his first tour. The final tour was with 35 Engineer Regiment in B.A.O.R., from which he retired from the Corps. Thirty-four years of sport oriented, physical soldiering, endured and enjoyed. He was supported throughout by his wife Kate and loved by his two sons, Steven and Andrew. Until his retirement in 1993, "Tubby" worked as an Administration & Financial Manager in the Distribution Industry. His work took him to Brighouse in West Yorkshire, where he became a very competitive member of his local Golf Club.